We can provide further options on the above if you require a bespoke pack of different numbers or letters. Contact our sales team on 01942 723101 for further information. 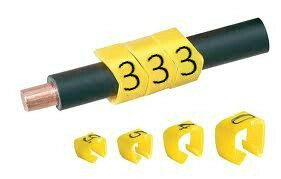 Direct alternative to the E-Type Cable Markers. Securely positioned with the help pf special legs. Designed for electrical, pneumatic, hydraulic etc.. applications. Material: Cadmium-free rigid PVC to special formula. Colours: Black on White, Black on Yellow or to International resistor colour code. Temperature range: The shape is permanent between -30°C and +60°C. Properties: Self-extinguishing, good resistance to chemicals, gamma and UV radiation. Standard legends: 0-9, A-Z, +, -, earth, / or blank. Special symbols available to order. These markers are chevron cut i.e. interlocking type.